During the hot summer months, no one wants to stay at home. That is why Avon, the cosmetics company, is offering customers shopping online a free stylish and practical tote bag with purchase.The promotion is available for all online orders $55 or over. Avon has chosen a classic promotional strategy, which is popularity due to the fact that customers enjoy it and it makes them feel valued by the brand. Avon will also benefit from this offer as customer loyalty increases, and positive word-of-mouth attracts new potential customers to the brand. Why we like this free tote bag with purchase promotional idea? This free tote bag with purchase is a great seasonal promotion and can help to boost sales, because of the minimum spend requirement. This is especially true during the summer months when customers are stocking up on holiday supplies. 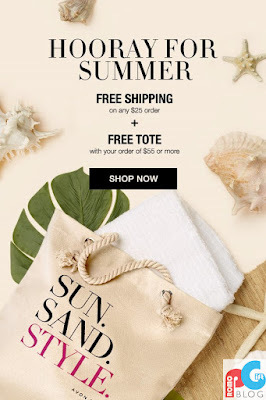 The free tote bag is also extremely practical to have, especially when Avon is also promoting for it to be used as a beach bag. PromoGift Blog would like to thank Avon for an insight into another amazing promotion offered.